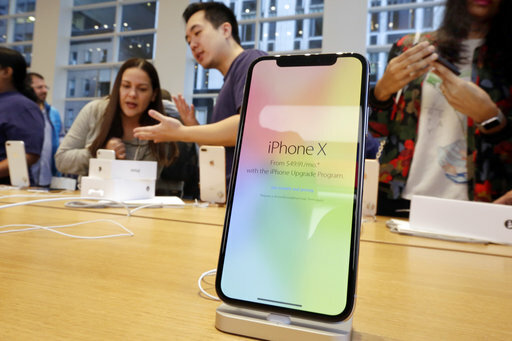 Piper Jaffray tech analyst Michael Olson, getting a jump on Apple's launch next Thursday of new iPhone models, published a research note Friday morning saying that its latest survey of iPhone users found demand for new models is likely to be stronger than expected. Olson raised his target price for Apple's stock to $250 a share, about 12 percent higher than it was trading before the market opened Friday. Apple shares were up about a half-percent in early trading Friday. Apple climbed 38 percent in the year since the last iPhone launch. Much of that gain has happened since April when investors started to realize that the higher-priced iPhone X was driving better-than-expected revenue and profit gains for the tech giant. For months before that, reports suggested that the iPhone X wasn't selling as well as forecasters thought it would. Olson continued a tradition of surveying the iPhone customer base that was started by Gene Munster, who followed Apple for years at Piper Jaffray and was one of the first investment analysts to recognize in the early 2000s that the company was morphing beyond being a niche maker of personal computers. In the latest survey, Piper talked to 488 iPhone users and found about two-thirds of them are using iPhones that are at least two years old. People with older iPhones are considered most likely to purchase a new one. Olson said he expects Apple will introduce three new iPhones next week, all with the full-screen look of the iPhone X. One will be a revision of the current iPhone X, then a smaller, cheaper one and a third one with an ultra-big screen. "This would result in three 'X-gen' models, providing more 'shots on goal' for potential upgrades compared to the single option of the $1,000+ iPhone X last year," Olson wrote. He noted that a Piper survey of iPhone users earlier this year found that one-third of people who said they didn't upgrade in late 2017 and early 2018 cited the cost of Apple's then-new models. The introduction of a lower-priced model with the full screen of the iPhone X could bring some of those shoppers out. "We believe a lower price point for a next ("X") gen form factor will be attractive to potential upgraders," he wrote. Olson told investors that he now estimates that Apple will sell 223 million iPhones in the fiscal year that begins next month. That's above the current consensus of Wall Street analysts of 219 million. He estimates iPhone sales of about 220 million units for the current fiscal year. Through the first nine months of this fiscal year, the period from last October through this June, Apple sold 171 million iPhones. Also Friday, an analyst at Goldman Sachs, Rod Hall, who has been cautious on Apple's prospects said he would "take this opportunity to eat our hat somewhat." He raised his target for Apple's stock to $240. "We had expected worse iPhone X demand and some pullback in the stock -- clearly neither of those two things happened."